I feel privileged to live in an age where a single meal is dedicated the same amount of love and care as what used to only be afforded the most carefully curated art show. That being said, in the world of artisanal well water (we, no joke, went to a restaurant recently that boasted this feature), home-brewed kombucha, and organic, farm-to-table everything, food experiences can, at times, feel a bit unattainable, dare I say, even precious, to the point where I miss the feeling of a good ol’ mom-and-pop joint. 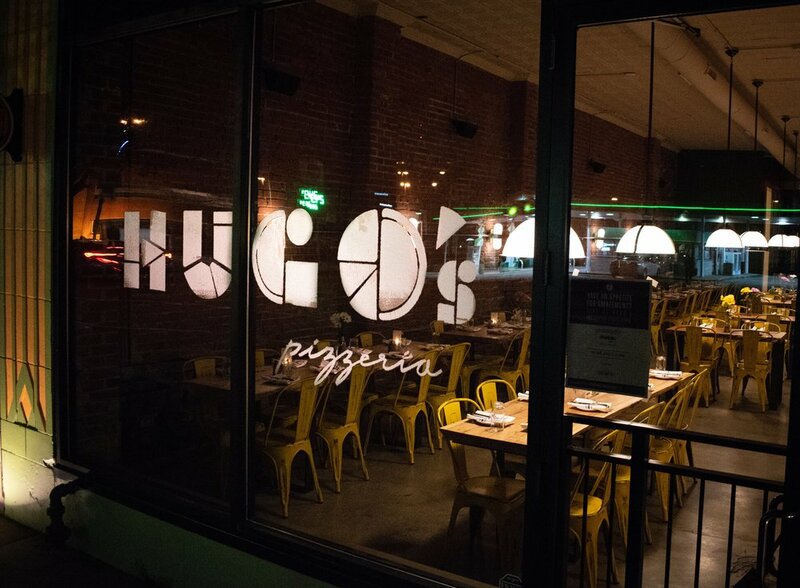 Hugo’s, a relatively new pizzeria in Midtown St. Louis city, effortlessly bridges this gap between these two concepts- supremely tasty pizza crafted with carefully selected ingredients, presented in a nostalgically simple, laidback environment. What’s even better, the menu has been crafted in a manner that is purposefully inclusive for my vegan brethren- options clearly (almost casually!) marked on the menu and no upcharges for vegan alternatives. Once you select one of the many fabulous options from the menu, the food is clearly and unambiguously the star of the show here, just as the way the pizza gods intended. Prolific is an understatement for Hugo’s owner, Dave Bailey, who operates several eateries around St. Louis (all of which have at least one vegan or readily veganizable entree on the menu), with restaurants ranging from Cajun cuisinieres to breakfast spots to upscale beer bars (where my husband and I had our first date). Most of these spaces are dramatically designed- Small Batch, a vegetarian restaurant/whiskey bar, features eye-poppingly cheeky baroque wallpaper, to an enormous installation of antique windows dangling from chains from the soaring ceiling of his gourmet burger joint, Range. Hugo’s on the other hand, while certainly on-trend, is a bit quieter in its design, with the dainty wildflowers at each table contrasting against the rustic exposed brick walls, hung with unassuming, muted artwork. This low-key atmosphere allows the restaurant to act as a great spot for a candlelit date night or the perfect place to sit down and break bread with friends and family in a decidedly chill environment. The morning after our wedding, I gathered at Hugo’s with my freshly-minted husband and our immediate family and it was the perfect place to recap the night’s shenanigans whilst stuffing our face with some much-needed pizza. One of the best things about Hugo’s is that the options are not limited to just pizza or a salad with several modifications (no cheese! sub the ranch! are the nuts candied in butter? ), as is the case with several pizzerias we’ve visited. 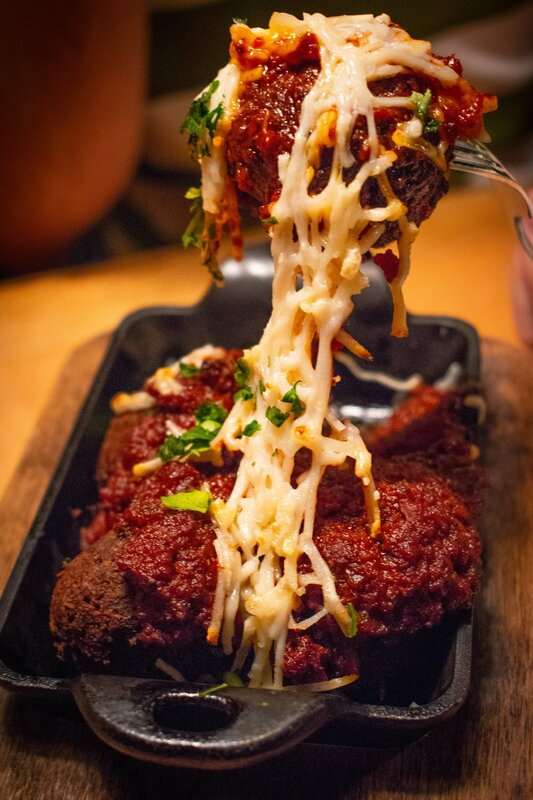 For an appetizer, it has vegan meatballs- hunks of perfectly spiced meaty balls, drizzled with robustly flavorful marinara, fresh basil, and perfectly ooey-gooey cheese.The texture is totally on-point, that melt in your mouth feeling that you get when biting into one of your Italian grandmother’s “famous” homemade meatballs. Served in its own personal sizzling cast-iron skillet, it is by far the best appetizer I’ve had at a pizza place in St. Louis. While I did not try the loaded fries starter (featuring fries smothered in the house-made sauce, mozzarella cheese, and pepperoni), it appears to be veganizable as well (as Hugo’s has happily substituted vegan cheese and their housemade pepperoni for me on other dishes!). If you’re feeling like feigning healthy choices, three of the four salads, featuring interesting ingredients like jalapeno vinaigrette and roasted tomatoes, can be modified to be vegan-friendly. With all of those starters, you GOTTA make sure you save room for the pizza! The crust, which is aged for 18-24 hours prior to cooking, is this chewy, yet airy delight- a welcome departure from the cracker-thin crust featured on St. Louis-style pizzas. It’s a good thing the crust is sturdy- while tasty in its own right, it is the essential vehicle for the crazy plethora of toppings piled on the pie. In the past, I’ve tried the "Green" pizza, which features garlic oil, mushrooms, roasted romas, tender broccolini, and fresh arugula. This time, though, we weren’t messing around- we opted for the "Lux", with roasted peppers, meaty mushrooms, mozzarella, and best of all, housemade meatballs and pepperoni. 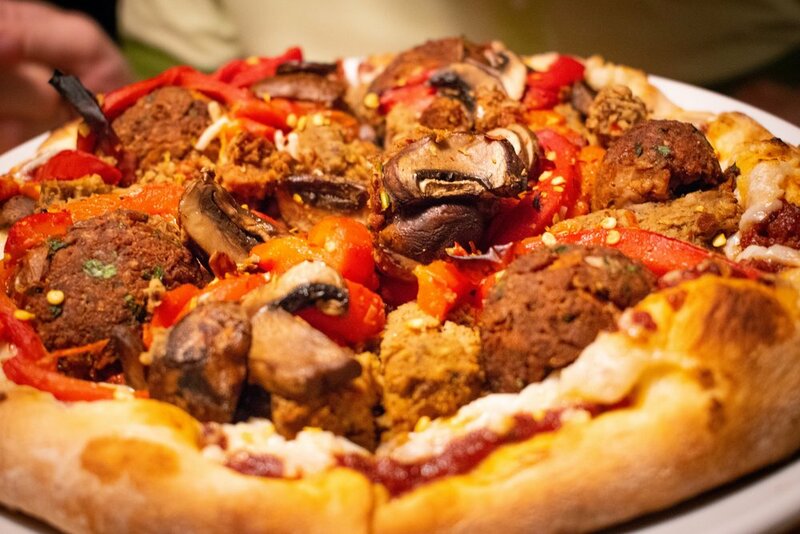 The pillowy crust, in combination with the chewy pepperoni, thick meatballs, and rich mushrooms, reminds me of a much more-refined, upscale version of the supreme pizzas my family would get at hole-in-the-wall pizzerias on the South side of Chicago when I was younger. The generous toppings make for a DENSE pizza; as a lady who can eat a lot (I have had more than one would-be suitor ask if I have a hollow leg; protip- things you should file under “what not to say to a woman”), I could stomach only about a slice and a half before being utterly stuffed. You know what makes a yummy pizza even better? One word: leftovers. While the menu options are a unique take on classic offerings (think sriracha red sauce and pickled onions), it is also approachable. There are times I go out to eat with my dad when he seems befuddled by the artisanal direction most restaurants have ventured off to (“they put maple BACON on doughnuts these days? !”) and there is nothing on Hugo’s menu that would leave him scratching his head. With a portion of the menu specifically dedicated to kiddos (again, two of the three options appear to be veganizable), this really is a great family gathering spot, from trendy hipsters to your grandpa who is just looking for a classic slice. Family-friendliness aside, consistent with Bailey’s other joints, the beverage program is thoughtfully selected. If you're trying to impress a date with your craft beer knowledge, this would be an excellent choice, as the bar heavily focuses on St. Louis microbrews (with a tendency towards light and hoppy selections that pair well with a slice). The cocktail menu also boasts several lighter cocktails, bubbly concoctions, with zesty, citrus bases- I love the idea of pairing such a hearty meal with a refreshingly light spritzer. During our post-wedding family gathering, I tried the Roma, a sweet tincture made of aperol, grapefruit, red pepper, and sparkling wine. It was wonderfully-suited for our brunch, all celebratory bubbles, a hint of simple sweetness and the perfect hint of spice. Really, that’s how Hugo’s feels as a whole- a sweet place to gather with loved ones and indulge for an evening, sharing conversation, laughter, and of course, some insanely good pizza. What's your favorite place in St. Louis to get a slice of pizza (if you’re looking to try other places, make sure to check out my post about Firecracker Pizza!)? Or (let's get crazy here), where is the best pizza you've had in the world? My stomach is full of wanderlust and ready and willing for your recommendations.